For winter biking, a classic jacket like The Beltless Biker Jacket with side laces, will allow you to adjust the jacket to fit snugly against the upper body. 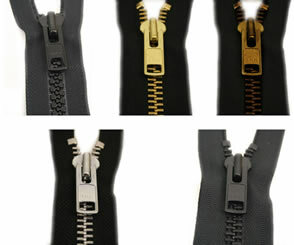 Of course, being able to fully zip up with YKK zipper only adds to your protection from the wind. 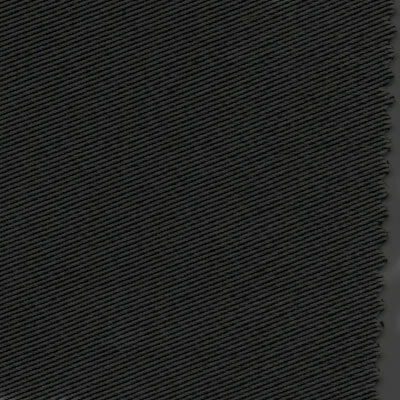 You can also count with Removable Thinsulate liner along with polytwill shell, for extra warmth and it will reward you with years of wear. 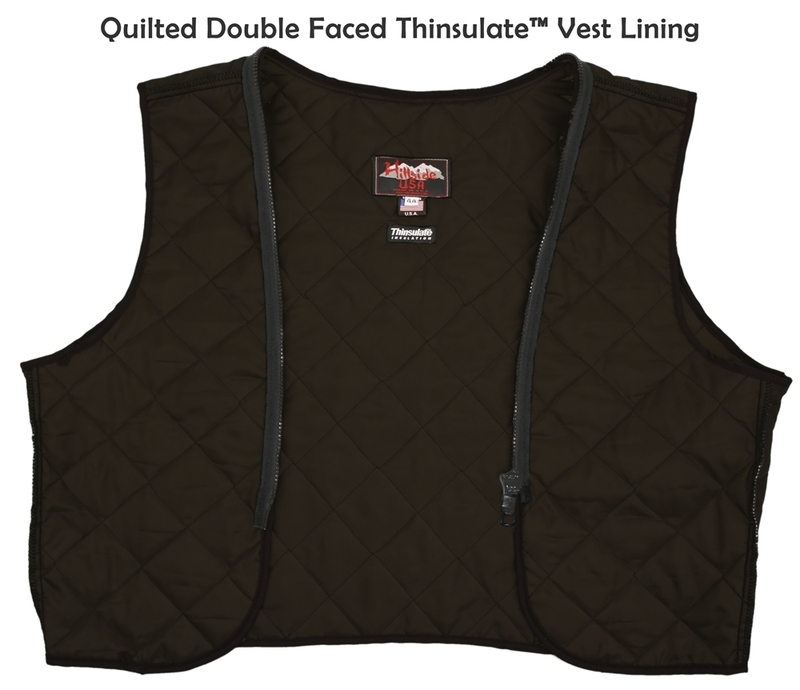 Just like the all Hillside USA's collection this jacket is constructed with 1.6-1.8 mm (4-41/2 oz) soft, supple, and thick Naked Leather, that will act like a second skin between you and the road and can quite literally save your hide. Classic jacket scooter. 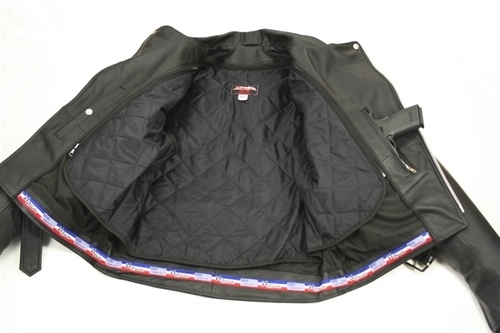 Features included: Two hand warmer pockets are leather-lined, two inside leather lined pistol pockets (approx. 9" deep) close with a snap on one side and the other with a zipper, both have a small internal pocket (4" x 4") for a gun barrel or cell phone. 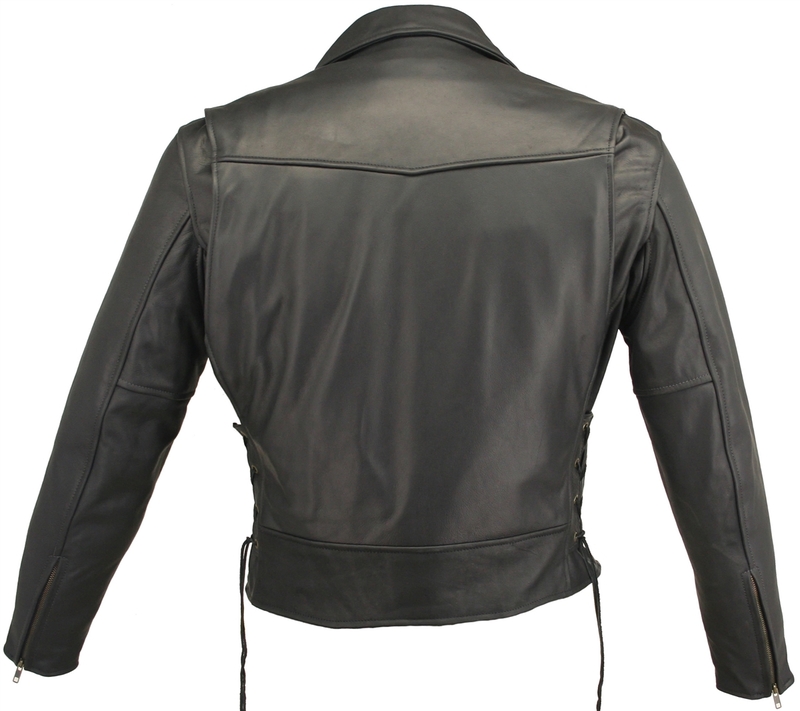 Now that you have found the perfect Beltless Black Motorcycle Jacket, take care of it, and it will reward you with lifetime, comfort and protection. Lifetime Guarantee. First, this is a well made product..top quality. This jacket is designed for style and protecting. 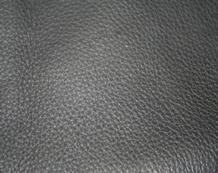 Leather is thick, yet soft and pliable. The lining will keep you warm on the cool days, zip it out and the jacket still can be worn on warmer days. The service is outstanding. Thank you Joe, oh and when Joe tells you what size you need believe him. Love this jacket and just ordered a vest. American Made and the very best quality and service...need I say more. The fitment could NOT BE any more PERFECT!!! What a great buying experience this was! 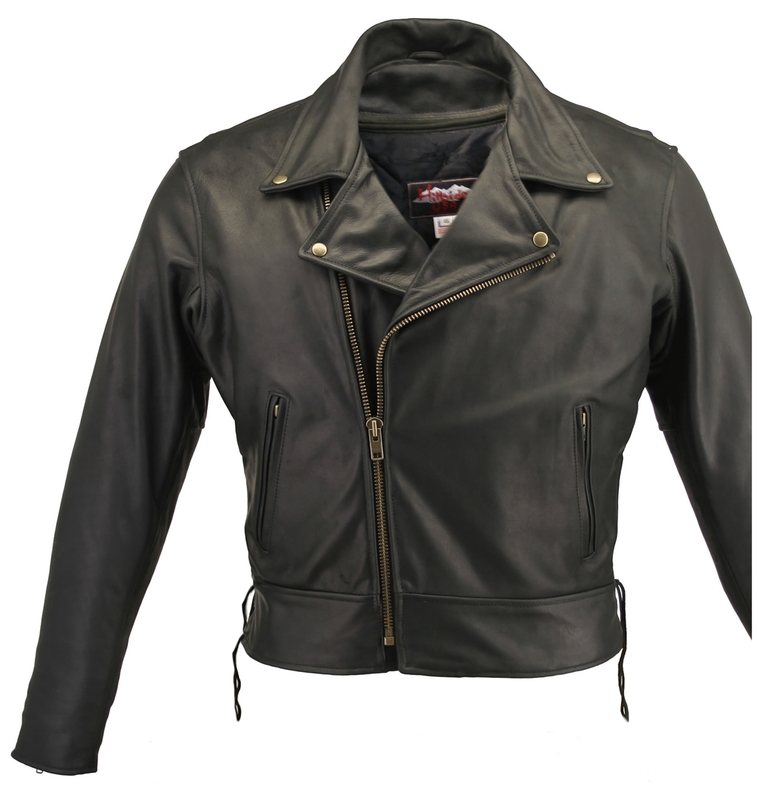 On 3/7/15 I ordered a mens beltless biker jacket. After the order was placed, I called a couple of times with questions and was always greeted with professional and friendly people who were more than happy to take the time to talk to me. Skeptical about the fit of the jacket, I was anticipating having to send it back to have it altered as they said I could do. We make them, so we can alter them is what I was told. (I love that!) I received the jacket a couple of weeks later and the Fedex driver actually waited to see the jacket I was bragging about, as she rides motorcycles too. We were both very impressed at the quality of it when I opened the box! (You may hear from her someday.) To my surprise the jacket fit great! Everything I was hoping for in a leather riding jacket. 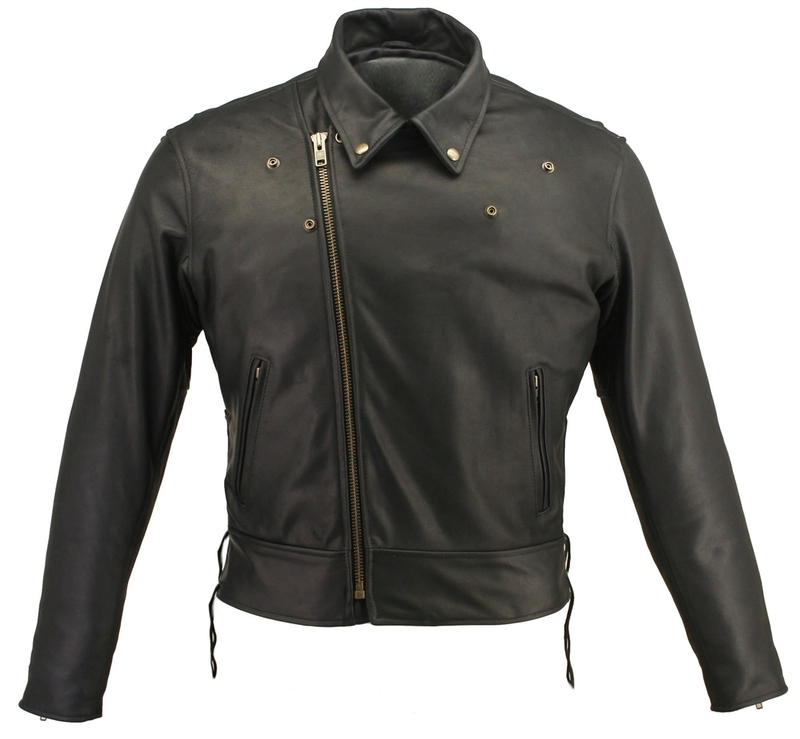 I am now a huge Hillside Leather fan and will tell everybody where to find an affordable USA made QUALITY leather jacket! No excuses not to buy an American jacket! What a great buying experience this was! First off let me say that the jacket is just outstanding and I love it, The Hillside jacket is outstanding in every way. I have recently placed my second order with Hillside, as I really enjoyed the last jacket I received. Let me just say that Hillside Leather is top notch in both quality and customer service. I special ordered a jacket because I wanted a minor change to one of the stock jackets. Unfortunately the fit was not quite right. I called and spoke to Joseph on the phone regarding the fit of my recent order. Let me start by saying the quality of the jacket is the best I've ever seen. I have also owned Fox Creek leathers so I'm not a stranger to a quality product. This product outshines any I have ever looked at. Hillside accepted my order back without batting an eye and had my new order shipped off promptly. I am extremely pleased with the fit and finish of my new jacket and I am certain it will last a life time. I have ordered several items from Hillside Leather. All of their products are of the highest quality and American Made. There is no better riding gear available anywhere for the money. The leather is premium and the workmanship is perfect. The customer service is simply the best. I will be purchasing more jackets from Joseph and his staff. Just received my Beltless Biker jacket in 48 long. I'm 6'1 215 and the jacket fits great - it's the best quality Leather jacket I've owned and I've owned many from the competition. 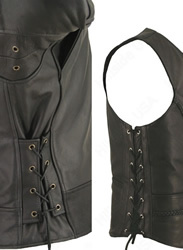 The leather is thick and supple and the hardware and Zippers are high quality. 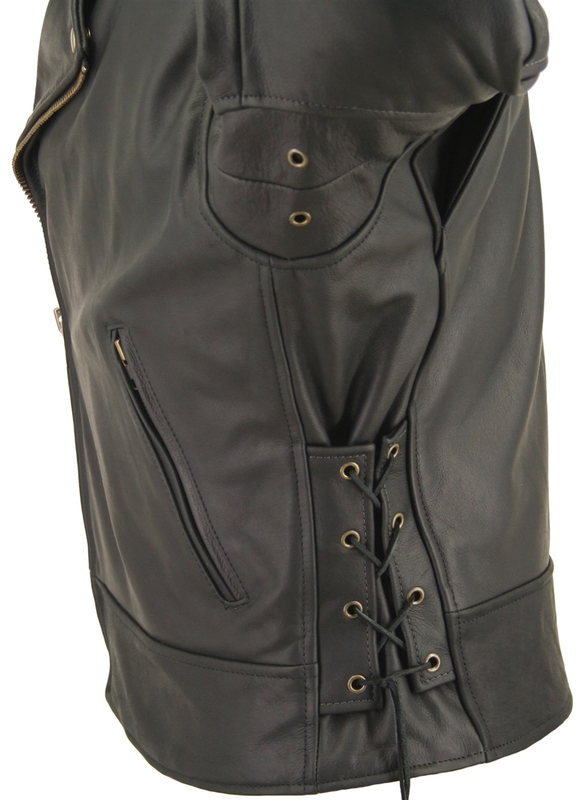 The removable liner is great and the leather lined gun pockets are robust. 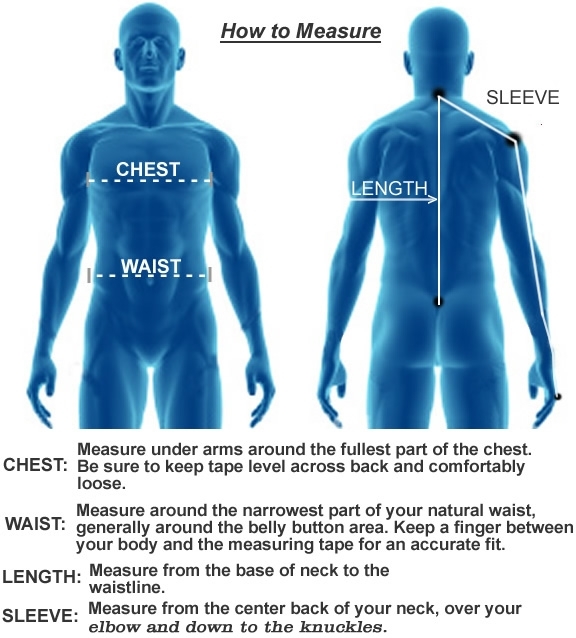 Also, Customer service was great answering my questions on sizing and delivery. I also own (2) Hillside gun pocket vests and they are also top notch. I ride about 5 days a week and this jacket has been great. The leather is high quality full grain, exactly as advertised. So far nothing has changed since the day it has arrived 3 months ago. The sales people are great here. I called before ordering because I am tall and thin, so jackets on me usually run either short in the torso or wide in the chest. I was asked my height and weight and was immediately recommended a size. That's what I ordered and it fits perfect. These guys are experienced and understand what they are selling. These jackets are heavy leather. I don't recommend it for hot weather stop/start commuting. It's fine for hot weather if you are moving the whole time. If you live in a hot part of the country buy a jacket with more vents. Think twice before buying any of that stuff from China or Pakistan. This is high quality American made and the cost is insignificant considering that you will likely have this jacket for decades. Amazing quality leather and a great jacket. Met and surpassed all my expectations. Joseph, I received the jackets on Wednesday. The Hillside jacket fit great. The quality and design of the jacket has met and surpassed all my expectations. Thank you for all the work you and the crew at Hillside put into getting me a jacket that fits. Hopefully the next jacket order will go smoother (52 Long). Thanks again. After riding for 50 years I've owned all types of jackets. Schot,Branded,Brooks,Fox Creek,Harley, Champlain,etc....This jacket is among the best I've owned. The leather is superb and the styling is great. 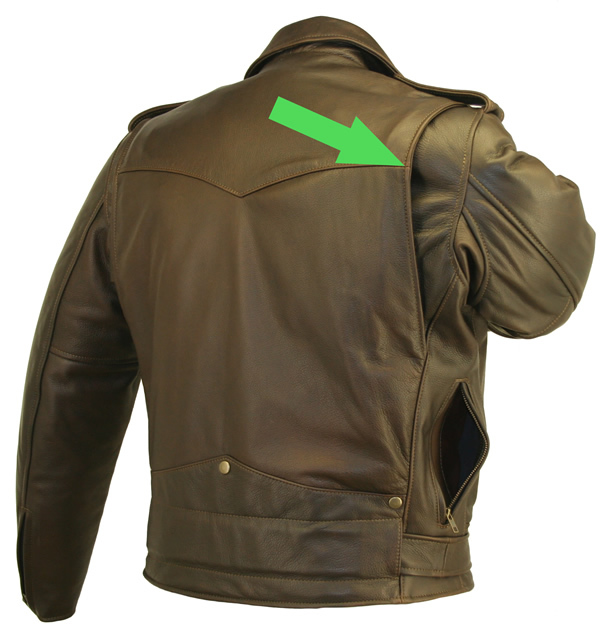 Just remember, it is a Heavy jacket, not for riding in Phoenix in the summer,but it will save your hide from the pavement. Nice people too. I received my jacket today, very nice. Thank you! Joseph: I got my jacket, it's perfect, and I am very, very happy with it. Thank you so much. Thanks for your patience and professionalism! Very happy with my jacket, Thank you!!! Thanks Joseph, Your Jacket is first rate and your service to ensure a satisfied customer is exceptional!! I sincerely appreciate how you guy do business. I recieved my coat today & I want you to know how happy I am about the way it fit! Its a awesome coat & I love it! I sincerely appreciate how you guy do business. Thank you for working with me regarding the first coat and rebuilding or making me a new one. I will definately pass the word! It's hard to appreciate quality like this until you purchase bargain junk. You can choose to save money by buying cheaper stuff but the quality is no comparison to Hillside. There is a big difference between the mass junk jackets out there and this one; fit, feel, and over all quality make this jacket one that will last a lifetime. I should have spent the money (about $80 more) on one made in the USA than the water buffalo crap that others sell from Pakistan manufacturers. Lesson learned. Do your research and buy quality leathers for your money, you won't regret it! The price made me reluctant but now I'm glad I spent the money. Heaviest, softest leather I've ever seen. Feels broken in from new. Construction and lining very high quality. Not a cheap lining like my other jackets. Fit is perfect by following their guidlines. I highly recomend Hillside USA. Support American made. The quality and workman-ship is excellent. The custom made jacket fits great. The quality and workman-ship is excellent. I was very happy to find an American made jacket of this quality at such an affordable price. Thanks again. Thank you for all your help. I very much appreciate your great customer service, excellent communication and quick shipping. I am very pleased with the quality of the leather and workmanship. I have already recommended you to a friend and look forward to doing business in the future.